Imagine going on a turkey hunt only to find there are no wild turkeys! It sounds far fetched, but in the early 1930s this grand game bird was on the verge of extinction. But today, thanks to hunters and wildlife restoration programs, the wild turkey is abundant and thriving in its homeland. Wild turkeys are native to North america and there are five subspecies: Eastern, Osceola (Florida), Rio Grande, Merriam's and Gould's. all five range throughout different parts of the continent. The eastern is the most common and ranges the entire eastern half of the U.S. The Osceola (Florida) is only found on the Florida peninsula, while the Rio Grande ranges through Texas and up into Oklahoma, Kansas and Colorado. Rios are also found in parts of the northwestern states. The Merriam's subspecies ranges along the Rocky Mountains and the neighboring prairies of Wyoming, Montana and South Dakota. and you can find Gould's throughout the central portion of Mexico into the southernmost parts of New Mexico and arizona. 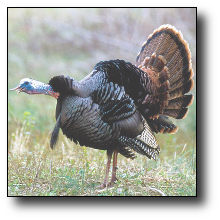 Between 5,000 and 6,000 feathers cover the body of an adult turkey in patterns called feather tracts. Most of the feathers exhibit a metallic glittering, called iridescence, with varying colors of red, green, copper, bronze and gold. The gobbler, or male turkey, is more colorful, while the hen is a drab brownish or lighter color to camouflage her with her surroundings. Two major characteristics distinguish males from females: spurs and beards. Both sexes have long powerful legs covered with scales and are born with a small button spur on the back of the leg. Soon after birth, a male's spur starts growing pointed and curved and can grow to about two inches. Most hen's spurs do not grow. Gobblers also have beards-tufts of filaments, or modified feathers, growing out from the chest-which can grow to an average of nine inches (though they can grow much longer). It must also be noted that 10 to 20 percent of hens have beards. Wild turkeys have excellent vision during the day but don't see as well at night. They are also very mobile. Turkeys can run at speeds up to 25 mph, and they can fly up to 55 mph. Lack of quality habitat was a problem in the past, but with the passing of the Pittman-Robertson act in 1937, an excise tax on sporting arms and ammunition, wildlife restoration programs now have money to use to restore wild turkeys and wild turkey habitat. and with the invention of the rocket net, wildlife agencies and the NWTF can trap and transfer turkey populations to areas of suitable habitat. From only 30,000 turkeys in the early 1900s to 6.4 million today, this intriguing species has truly made an awesome comeback. Thanks to National Wild Turkey Federation for this information.